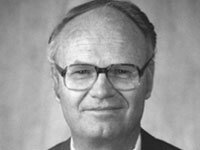 Donald Veal, former president of the University of Wyoming and a longtime UW faculty member, died Sunday, Jan. 20, in Longmont, Colo. He was 87 years old. Services are scheduled Saturday, Jan. 26, at 10 a.m. at Central Presbyterian Church, 402 Kimbark St., in Longmont. Veal served as UW’s 20th president from 1981-87. He first came to UW as an instructor in civil engineering in 1958, pursuing graduate studies at the same time, leading to an M.S. degree in 1960 and a Ph.D. degree in 1964, both in civil engineering. In 1971, he became a professor and the first head of UW’s Department of Atmospheric Science. Beginning in 1966, Veal was involved in development of airborne platforms for atmospheric research, including several generations of airborne data systems and techniques for interfacing atmospheric sensors. He was internationally recognized for his work in airborne cloud and storm research, also having served as director of the National Hail Research Experiment at the National Center for Atmospheric Research. Before becoming president, he was UW’s vice president for research. Veal served on numerous committees and boards, including the National Academy of Sciences, the National Research Council, National Science Foundation, University Corporation for Atmospheric Research and the Western Interstate Commission on Higher Education. A native of Chance, S.D., Veal earned his bachelor’s degree in civil engineering from South Dakota State University in 1953. He was commissioned a second lieutenant in the U.S. Air Force and was assigned to the Air Force Training Command, where he served as an instructor pilot until he was honorably discharged in 1957. In addition to his work as a research pilot at UW, he flew for the U.S. Forest Service and gave private instruction in his spare time, logging more than 11,000 hours in the cockpit. Upon his retirement from UW, Veal became president and CEO of Particle Measuring Systems in Boulder, Colo., a company that specializes in the manufacture of instruments to optically observe small particles in various media. He held that position for eight years. He received the Distinguished Alumnus Award in 1983 from South Dakota State and the Medallion Service Award in 1990 from UW. He was a member of the Wyoming Engineering and Wyoming Aviation halls of fame. He was preceded in death by his wife, Bonita, in 2017.